The best way to spark interest is to get them started on the water! So, GGRC has this one-week summer program to get kids interested in a sport they likely know little about. The Mystic River is an underutilized resource that can be a great source of recreation. 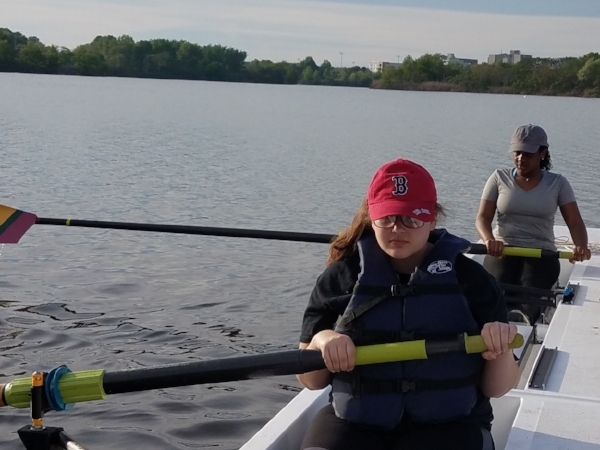 Our programs not only give rowers a physical challenge but also exposes them to the nature that is right in their backyard! The kids will start their session on land. They'll be taught about the equipment they'll be using and stretch! Form there, they'll get on our rowing machines or "ergs" where they'll start taking some practice strokes. 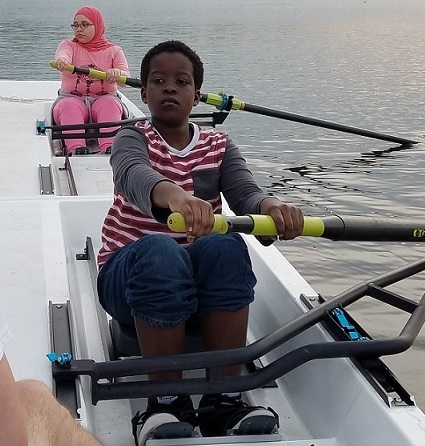 There's a lot to rowing and this time on land will help them learn the basics. Then we take them down to the dock! They'll get in the barge and take their first strokes on the water. The barge will be tied off against the dock and there will be hands on instruction from the coach. Once they've learned the basics, they'll be out on the Mystic! It's good to know what they'll be using! The Barge - The barge is an 8 rower hull that stays in the water during our season. It's solid and built to give rowers a very stable platform to learn on. Our coaches have taken out our experienced rowers when they want to teach them something specific. For new rowers, this makes learning easy, productive, and fun! No worries about stability or flipping! The Oars - The oars are about 10 feet long and are what make the boat go. The coach will be the "coxswain" for this program as well. (The coxswain is the person that steers the hull.) These are the same oars all of our rowers use. What to wear? - As you might be able to tell from the pictures, the seats move. This means that loose clothing may become caught in the tracks causing a bumpy ride. Rowers should wear clothes that do not hang too low or are too loose. You'll also need sneakers. The feet will be strapped in as you row and we want your feet to be comfortable! Also, in the event of weather not cooperating - high wind or thunder and lightening - we'll practice indoors. WE DO ROW IN THE RAIN! Sunscreen & Bug Spray - Because we are out in nature, these are recommended. Phones - We recognize that some kids have phones but bringing them in the boat is not recommended as they could end up in the river. GGRC is not responsible for phones that go for a swim. The coach will provide contact information to the parents prior to the first practice. Should their be an emergency, you'll be able to call them. The Cost - For the one week camp, the cost is $50. For this program, GGRC waives the $40 Membership Fee! How do you sign up? Click below!